It’s Follow-Up Friday: Cartoons and Crosswords edition! 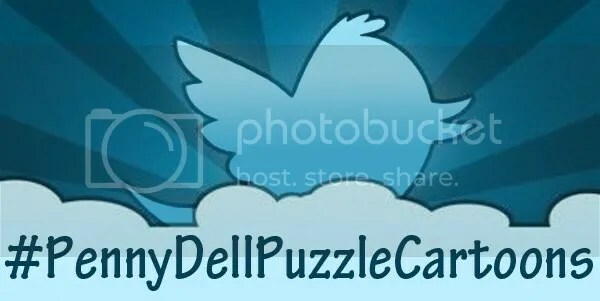 And today, I’m posting the results of our #PennyDellPuzzleCartoons hashtag game! For the last few months, we’ve been collaborating on puzzle-themed hashtag games with our pals at Penny Dell Puzzles, and this month’s hook was #PennyDellPuzzleCartoons, mashing up Penny Dell puzzles and anything and everything having to do with stand-up comics, film and television comedians, funny movies, funny shows, funny plays…even one-liners or jokes! Examples include Letter Powerpuff Girls, SpongeBob Four SquarePants, and Betty Blips. Who Fiddler’s Framed Roger Rabbit? / Who Frameworked Roger Rabbit? Scooby Two by Two, Where are you? AnagraManiacs Magic Squares, with Yakk-odewords, Wakk-o Words and Dot Matrix. A fellow puzzler even cooked up a version of the Steven Universe theme song all about Crypto puzzles! Have you come up with any Penny Dell Puzzle Cartoons entries of your own? Let us know! We’d love to see them! This entry was posted in Games, PuzzleNation, Puzzles and tagged 101 Dalmatians, @midnight, activate!, Alvin and the Chipmunks, Animaniacs, animation, Atom Ant, Bambi, Bart Simpson, Batman and Robin, beavis & butthead, beavis and butthead, bender, Betty Boop, by the power of greyskull, cartoon, comedy central, conjunction junction, Courage the Cowardly Dog, Darkwing Duck, DIY puzzling, Donald Duck, Dudley Do-Right, Exit stage left, Family Guy, Follow-Up Friday, Friendly Neighborhood Spider-Man, Futurama, games, Geeking Out, Greyskull, hashtag, hashtag game, hashtag wars, He-man, heroes in a halfshell, Homer Simpson, I'm just a bill, Johnny Quest, Looney Tunes, magic school bus, Masters of the Universe, meeces to pieces, meeses to pieces, Miss Piggy, Mystery Machine, Penny Dell Crossword App, Penny Dell Crosswords App, Penny Dell Puzzles, Penny Press, Penny/Dell Puzzles, Pop culture, Porky Pig, Powerpuff Girls, puzzle cartoons, PuzzleNation, Puzzlin' fool, Quick Draw McGraw, Quickdraw McGraw, real monsters, roger rabbit, Schmovie, Schoolhouse Rock, Scooby-Doo, Scooby-Doo Where Are You?, Spider-Man, Spongebob, Spongebob Squarepants, stage right even, Steven Universe, Superman, Teenage Mutant Ninja Turtles, That's all folks, The Flintstones, The Jungle Book, The Simpsons, Three is the magic number, Top Cat, turtle power, Underdog, Where Are You?, who framed roger rabbit, Wonder Twins, Wonder twins power, Wordplay, Zip-a-dee-doo-dah by gmdirect. Bookmark the permalink.